The delicious flavours of thyme and feta bring a special touch to this simple-to-throw-together dish. So many cultures have their own versions of this egg-based savoury dish. The Spanish have tortilla, the Arabs have eggah, and in Iran similar baked omelettes are known as kuku. In any language, it’s delicious. Note: This recipe can be halved if making a starter or serving a smaller number of people. 3. Brush the griddle pan with olive oil and heat over a medium heat. 4. Using the tongs, place the asparagus across the griddle lines and cook, turning regularly, until the asparagus is lightly browned. Remove from the heat and set aside. 5. Break the eggs into the large bowl, add the feta and cream, then whisk briefly until combined. Season with the salt and pepper. 6. Heat the two frying pans over a medium heat. Add a small amount of olive oil to each frying pan, then add half of the onion to each pan. Lightly sauté the onion until it becomes translucent, about 5 minutes. 7. Pour half of the egg mixture into each pan and let it cook for a few minutes. 8. Place half of the asparagus in each pan, gently placing the stalks in the egg mixture like rows of soldiers. 9. Sprinkle half of the thyme over each frittata. 10. Cook gently until each frittata begins to pull away from the edge and bottom of each pan, and looks set and golden brown. 11. Put the frittatas under the grill, one at a time and cook until lightly browned. 12. 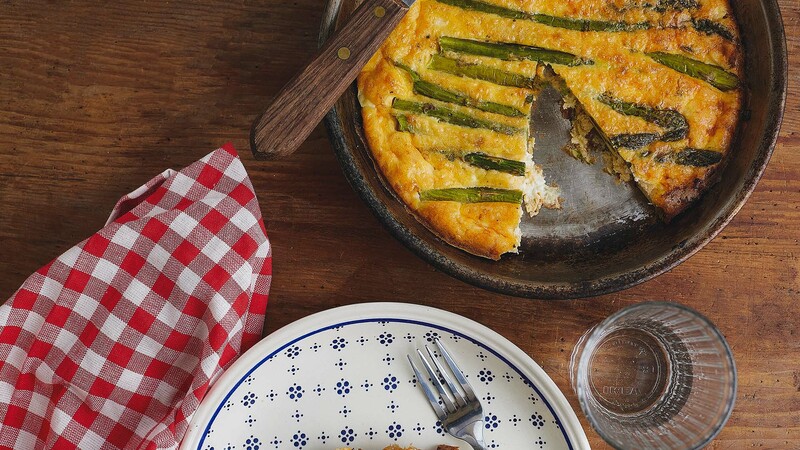 Remove the frittatas from the grill and set aside to cool slightly before sliding them out onto serving plates. 13. Cut the frittatas into wedges and serve.